8 September 2012. 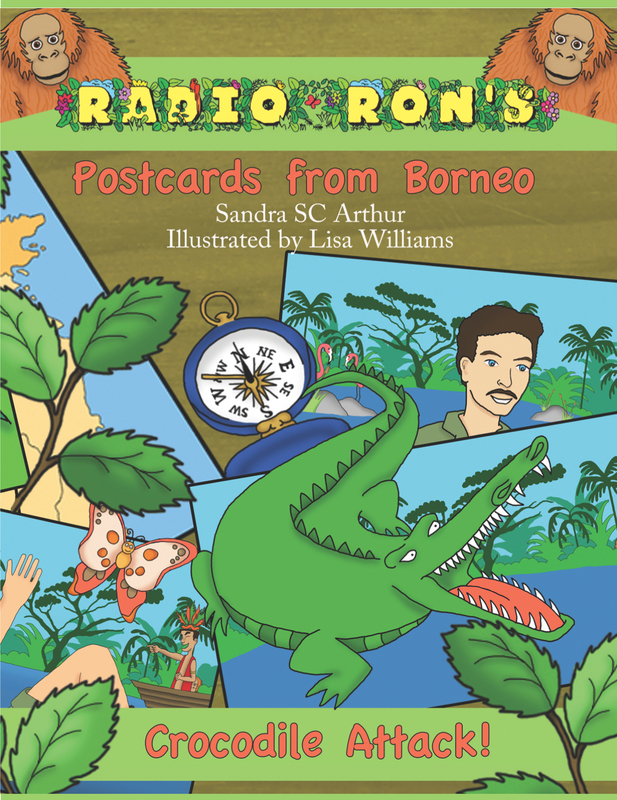 In the week that will celebrate International Literacy Week and also see the British royal couple, the Duke and Duchess of Cambridge, visit the largest remaining rainforest in Borneo, children’s author, Sandra Arthur will release her latest early learner picture book, Crocodile Attack, from her series: Radio Ron’s Postcards from Borneo. Crocodile Attack features Borneo’s rainforest as its backdrop for the curious story of “Radio Ron” (a Royal Air Force Radio Technician) who takes a journey with Dayak tribes-people. This is a vivid, fun and thought-provoking adventure book for children under nine years that is also proving popular with children who are learning English as a second language. The story is a work of fiction, but was written as a tribute to the author’s father, who was with the British Royal Air Force in Borneo during the mid 1960’s. This humorous picture book, illustrated by British artist Lisa Williams, will appeal to all children, young and old. At the same time, readers will learn interesting facts about the endangered orang utans (orang-utans) of Borneo. The book is completed with environmental information and parent and educator notes, for a lively reading and educational experience. Whilst the story is fiction, the background to the light-hearted story is based on historical events. As children develop their own reading skills they can catch up on the adventures of “Radio Ron” in a junior fiction book, Cpl Ron’s Borneo Warrior Rescue, that has received accolades worldwide. Sandra commented, “As book lovers around the world celebrate International Literacy Day I hope that my book will be picked up by parents and educators in their quest to help children develop a passion for books. Learning to read is one of the biggest milestones young children face. By offering a fun approach to early reading practice, I hope my work may encourage a life long love affair with reading and books (whether on an electronic screen or paper). I’m delighted to say that my Radio Ron stories are already known around the globe via a great project called Educate Earth (see note below). This book also includes games, puzzles and suggested classroom activities. The story offers many of the high frequency words children learn between ages five to nine. There are also a number of “word builders” to help children increase their vocabulary. This new book is now available on lulu.com as a paperback, hardcover, ebook (pdf) and later on iTunes as a special ebook with voice-over and music for an upbeat reading experience. 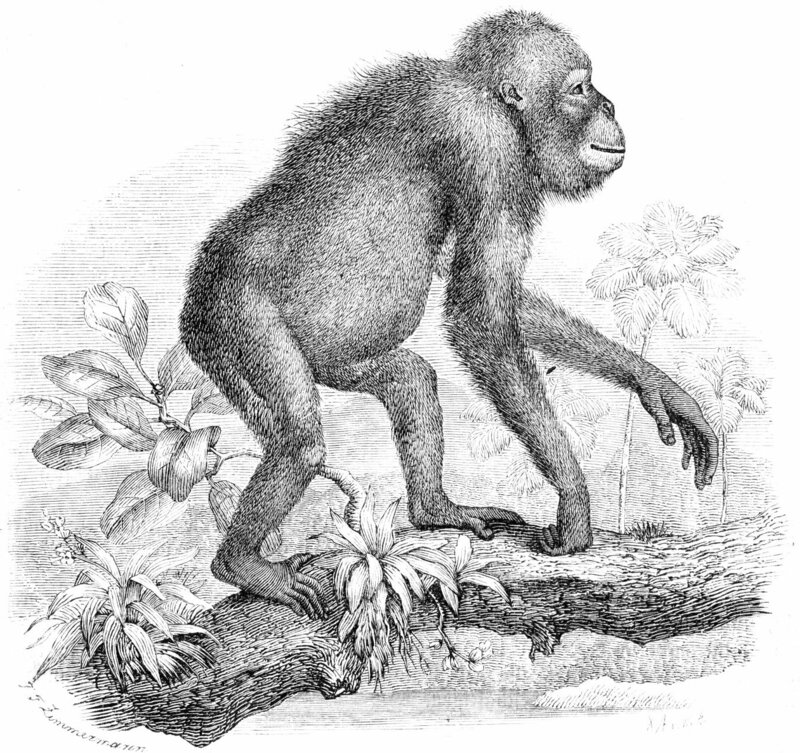 Due entirely to human activity, the population of orang-utans in Borneo is now only 12% of what it was less than a century ago. Due to logging and palm oil production these great apes are losing their natural habitat and could face extinction in the wild by 2022. Orang-utans are known as keystone species and extremely important in retaining the biodiversity within the Borneo rainforest. When a keystone species decline or they completely disappear, the survival and abundance of many other species in that ecosystem are negatively impacted. Their protection is vital to the overall health of the lowland forest ecosystem in which they thrive. In contrast, the vitality of the orang-utan population will only flourish if their forest home is kept undisturbed and intact. How is Sandra Arthur’s Radio Ron Postcards from Borneo helping to educate people who can’t normally afford to buy their own books? An Australian entrepreneur selected Radio Ron’s Postcard from Borneo to be part of a new educational DVD for distribution to families around the globe. Called “Educate Earth” a group of education clips from YouTube (with author permission) and other sources was compiled onto a DVD that was supplied to impoverished communities in Kisii in Kenya, Adum-Kumasi in Ghana and Vanuatu, an island is the South Pacific. Other locations will be added over time. The hope of this project is that wherever there is access to a portable dvd player, laptop or TV (such as in a school, hospital, health centre, doctors waiting rooms etc) individuals can watch and secure an education without even attending school. Many poor people in these regions cannot afford an education. Educate Earth DVDs were shared with parents to help them educate their children, if they cannot afford to send them to school. At the same time, the range of stories included on the DVD are equally entertaining for adults who may have missed out on schooling and thus can learn by watching them with their children. How will Literacy Week will be supported by Sandra Arthur? Sandra Arthur has planned a series themed readings at local schools, bookshops and kids clubs in the south of France, Kingston ON, Canada and potentially UK (to be announced) not only in during literacy week but throughout the fall period. Where can you preview the Radio Ron’s series of books? Link to lulu’s website here – the title is available as paperback, hard cover, ebook and epub with audio. International Literacy Day, traditionally observed annually on September 8, focuses attention on worldwide literacy needs. More than 780 million of the world’s adults (nearly two-thirds of whom are women) do not know how to read or write, and between 94 and 115 million children lack access to education. In September 1966 the World Conference of Ministers of Education on the Eradication of Illiteracy was held in Tehran, Iran. 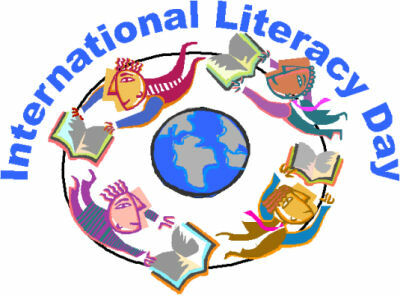 September 8, the opening date of the conference, was proclaimed International Literacy Day. The United Nations Educational, Scientific and Cultural Organization (UNESCO) inaugurated its official observance of International Literacy Day in 1967. To find out more about International Literacy Day, visit UNESCO at www.unesco.organd the International Reading Association at http://www.reading.org. International Literacy Day page at http://www.reading.org. With so much of our lives now being shared online, it is no surprise that the young children of today need to be technically savvy and adapt at using the web. We are all being bombarded with more information, in one week, let alone one year, than our forefathers would have perhaps been exposed to in their LIFETIME. For an average person on an ordinary day, it amounts to 34 gigabytes of data or 100,500 words. Input comes from a variety of sources unrelated to work/school, including movies, mobile phones, television, the Internet, video games, newspapers, magazines, books and music. This to some degree is driving children to have a very short attention span. Thirty minutes of TV, ten minutes with DS Games, another twenty minutes with X-Box, fifteen minutes on social media sites, 5 minutes to catch the latest music online or on iPods or more! You may be surprised to learn only 14 percent of people on the planet have access to the Internet (source: United News Center). The majority of Internet users (90%) live in industrialized countries, so internet laggards beware. Currently, electronic games and mobile devices are generally static – so one can draw parallel examples with perhaps reading which is also static. However there is a new breed of dynamic, interactive, multi-player and networking games on the horizon. These are enabled by new platform technologies, higher processing power, improved graphics, virtual worlds and location-based technologies. Their role in helping the young to read should not be dismissed, as they do require different levels of reading to understand game rules, answer questions and figure out complex games. It’s easy and fun for kids to escape “this world” and loose themselves as they text, email, surf the web or simply turn on the TV. It is therefore no wonder that kids have short attention spans: they find reading a traditional paper book “boring” and a “challenge” to wade through 150 + pages of plain text. The “want it all now” generation are growing up in very different times, where less is left to imagination and more is required from media, on demand. It is therefore a tough challenge to kick-start reading in a fun way, that will then hopefully develop a lifetime love to read books (be it via eBooks or on paper). When faced with a new book or novel, kids may encounter unknown vocabulary, they may have no background on the subject they are reading, and perhaps, they have no choice as to what they can read – being instructed by teachers to read a certain book. If we compare this to their free or hobby time, kids have a choice on what they want to do, they plan when they can devote time to their hobby and they determine how hard they wish to make their particular pastime. These ideals can be applied to the reluctant reader. By allowing them to make some of the reading decisions: what, when, where. The result will be a more motivated and energised child. With these factors in mind, I have tried to apply a multi-media approach to my own book writing. First, for the early reader (4-7 years old) I developed some fun, environmentally themed stories and offered these free on YouTube. The mini series: Radio Ron’s Rainforest Adventures are believed to be one of the first early reader books (with narration, sound effects and original music) to be placed on YouTube. The HD feature in YouTube, makes an ideal reading experience on computer, TV or mobile phone screen. With a more technology-savvy generation, it is an approach that has appealed to youngsters. The stories have been hosted on a variety of charity websites, around the world, including the Australian Orangutan Project. I wrote the Radio Ron’s Postcards from Borneo series to raise awareness on the plight of orangutans who face extinction in the Borneo rainforests. I’m hoping this work will stimulate interest in this topic and encourage people to donate funds to orangutan charities. Learning to read is one of the biggest milestones young children face. By offering a fun approach to early reading practice, I hope my work may encourage a life long love affair with reading and books (whether on an electronic screen or paper). And, at the same time, an interest in environmental issues. Radio Ron has been a true family effort with illustration and voice over contributions by my, then young, six-year-old twin sons; plus voice over, music composition and performance and video creation by my husband, Richard Arthur. With the success of this series, I am in the process of having the illustrations re-drawn so that an both printed and eBook formats can now also be supplied to the 2.0 generation! Clearly, motivation varies from child to child depending on their mood, health, etc. My second writing project set out to offer a cross curriculum approach – embracing English, history, geography and music, and also offering an online multi-media angle in addition to the book reading experience. 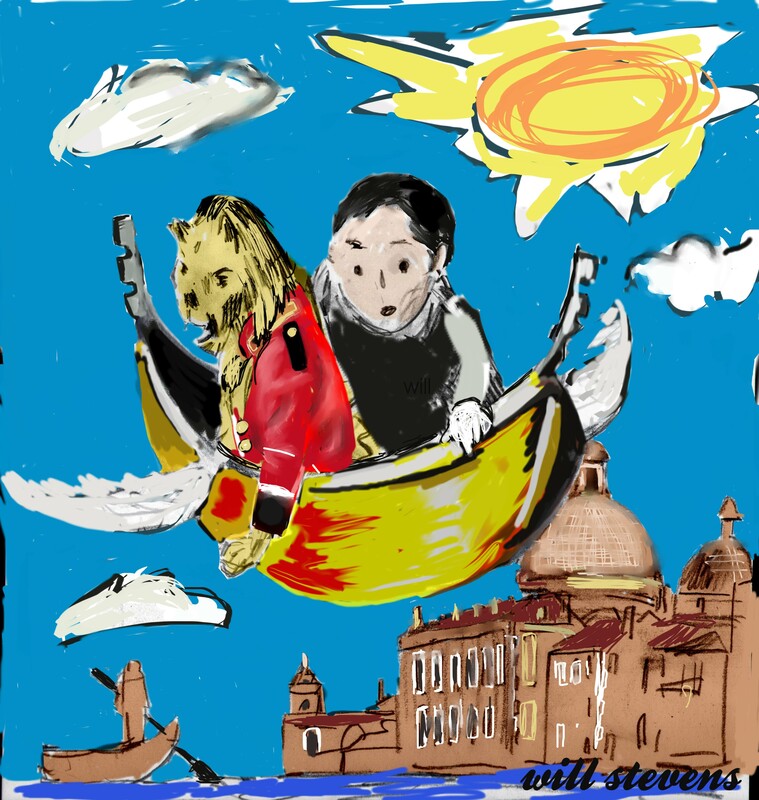 The result has been Venice Escape – Maria’s Golden Gondola Adventures, a junior fiction book aimed at 9 to 13-year-olds. I have found out that it is also being enjoyed by older folks. They report they are remembering long forgotten history and being excited by the notion of hearing and seeing music clips online! Blending the dual themes of music and Italian luminaries, I created a whirlwind time travel adventure of a young girl eager to learn about the world outside her cloistered Venetian surroundings. This junior travel fantasy paints geography, history, music and adventure on the canvas of a light-hearted voyage of self-discovery for a young heroine. 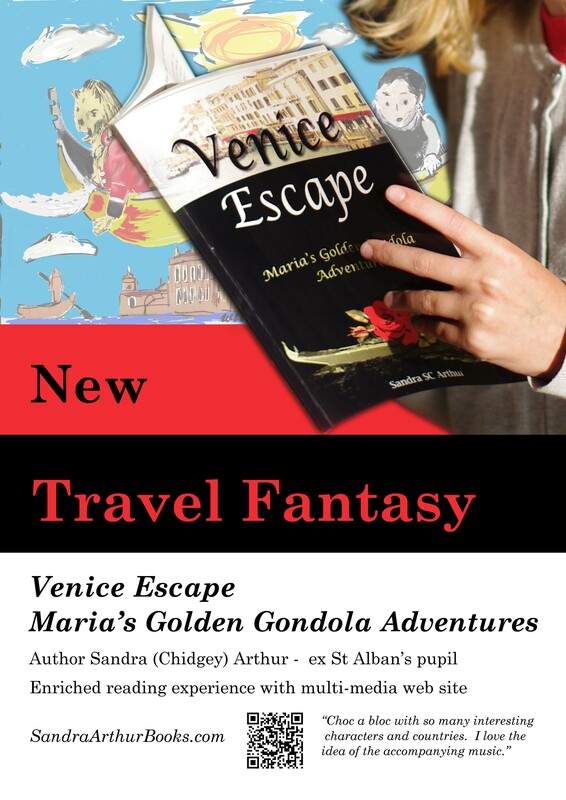 Venice Escape also contains an appendix where readers can learn more about the Italian explorers and Vivaldi featured in the story. There is also a companion multi-media website with music clips for each instrument and musical style. My free online resource has been developed to offer readers of Venice Escape an improved reading experience, and at the same time provide teachers with the opportunity to use this material to trigger cross-curricular discussions in their classes. My hope is that the book will be used in schools to assist discussion on music genres/instruments, history and geography. Alternatively, young readers can simply enjoy linking to the music sounds and reflect back on how Maria would have enjoyed hearing this music for the first time. In conclusion, I urge you all to take your kids to the library or review the latest range of eBooks online – and let them choose a fun title or gently recommend something new or a title you know is a winner. Curl up on your sofa, grab your chosen book and let your imagination escape with a fantasy novel tonight – it could be the start of a lifetime adventure, offering your child (and you) the enjoyment and pleasure to read. Excerpts and links may be used, provided that full and clear credit is given to Sandra Arthur and My Global Event Reports. Remembering 1978 FA Cup Ipswich’s final success! On the Road from Damascus to Victoria, BC. Local Musicians and Dancers support Benefit Event for Syrian Refugees. Creative ways to teach teens! The scope of this blog is to provide reports from communication events and other sectors such as music and environmental campaigns. The underlining theme within each section will be how technology is helping to improve our lives.